A fine map of Maryland and Delaware dating to 1861 by A. J. Johnson. 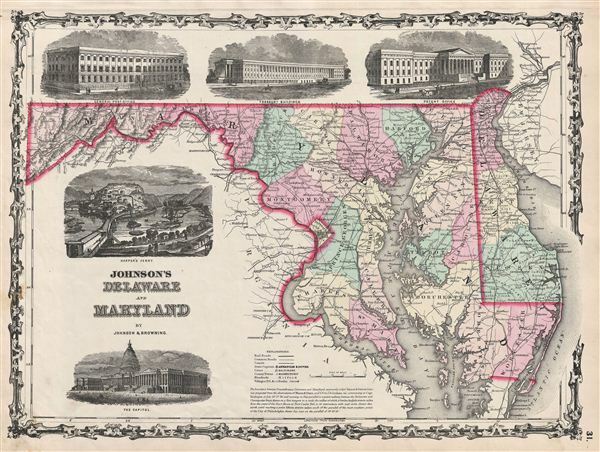 This is the most decorative example of Johnson's Maryland - Delaware series. Along the top of the map, in what would be Pennsylvania there are three engraved images of important government buildings: The General Post Office, The Treasury Buildings, and the Patent Office. In the lower left quadrant there are engraved views of the Capitol Building and Harper's Ferry, an important gateway to the west. At the bottom of the map, in the center, a text block describes the work of Mason & Dixon in drawing the Pennsylvania - Maryland border along the 38th latitude. Cartographically this map is based upon the earlier work of J. H. Colton. This particular example is the first of this series in which the government buildings appear at the top of the map. The previous variant, 1860, features only the capitol building in roughly the same location. The next variant, taking a hint from Colton, will drop out the views in the lower left quadrant entirely in exchange for an inset plan of Washington D.C. Features the strapwork style border common to Johnson's atlas work from 1860 to 1863. Published by A. J. Johnson and Browning as plate number 31 in the 1861 edition of Johnson's New Illustrated Family Atlas. This is the last edition of the Johnson Atlas to bear the 'Johnson and Browning' imprint. Subsequent editions reflect Ward's 1862 acquisition Ross C. Browning's shares in the firm.